This week, the Centers for Medicare & Medicaid Services (CMS) will recognize ways in which Medicare and Medicaid have transformed the nation’s health care system over the past five decades and how we can strengthen these programs for the next generation. As we mark the 50th Anniversary of Medicare and Medicaid, we are reminded of the critical role these programs play in protecting the health and well-being of millions of families and improving America’s economic security. The 50th Anniversary is also an important opportunity to raise awareness about the services Medicare and Medicaid provide to Americans. This is a chance to engage in conversations with providers, beneficiaries and their families and share stories about how these programs are changing people’s lives. The information below includes a collection of resources for you to explore as you consider options for marking the 50th anniversary. We encourage you to be creative and to use the anniversary as an opportunity to spark a dialogue with those in your community the important role health care programs play in their lives. •Thunderclap: Help us celebrate the 50th Anniversary of Medicare and Medicaid by participating in our Thunderclap on July 30. It’s easy: all you have to do is visit: https://www.thunderclap.it/projects/29172-medicare-medicaid-50th?locale=en and select one of the red buttons on the page to support CMS’ 50th anniversary via your Facebook, Twitter, or Tumblr account. •Tune in to the National Event: On Wednesday, July 29 at 10:30 AM EST, CMS will hold an event at the U.S. Department of Health and Human Services to commemorate the 50th Anniversary. Secretary Burwell, CMS Acting Administrator Andy Slavitt and a panel of distinguished experts will discuss how Medicare and Medicaid have changed society. The event will be streaming live on the Health and Human Services website at www.hhs.gov/live-1. •50 Facts in 50 Days: In the 50 Days leading up to the anniversary, CMS is sharing daily facts on Twitter. The information we are sharing highlights the people, places, and progress that represent the Medicare and Medicaid programs. We encourage you to share this information with your constituents by retweeting our posts. 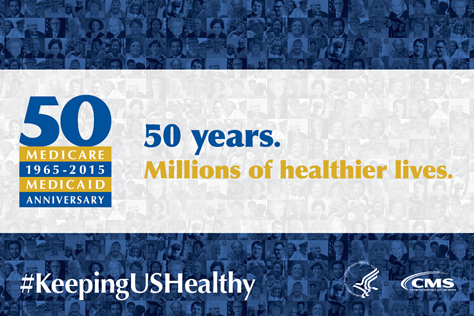 The official hashtag for the anniversary is #KeepingUSHealthy. •Like Medicare on Facebook: As part of the agency’s 50th anniversary celebration of Medicare and Medicaid, CMS launched its Medicare Facebook page. (www.facebook.com/medicare) Our page serves as an important informational resource for those who will soon enroll in Medicare and people currently with Medicare coverage. CMS looks forward to providing our community with the latest information and updates on our nation’s largest health insurance program. Happy 50th Anniversary to #Medicare and #Medicaid! Thanks for #KeepingUSHealthy. ***ADDITIONAL SOCIAL MEDIA SHARABLES ARE AVAILABLE ON THE CMS TWITTER PAGE.